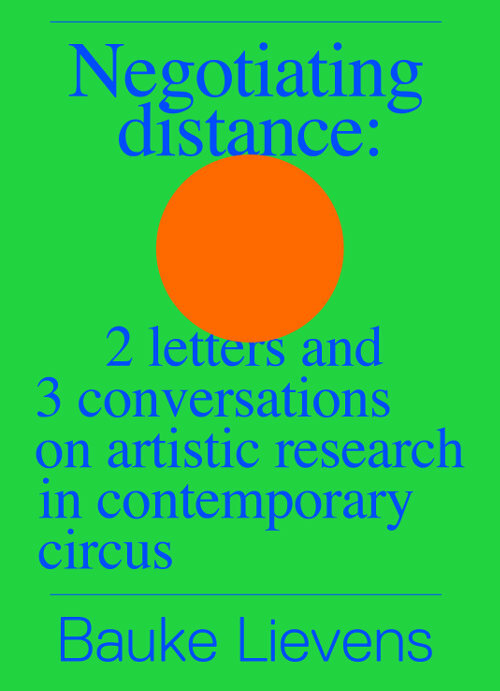 Excerpt of the paper edition Negotiating distance: 2 letters and 3 conversations on artistic research in contemporary circus, published in January 2018. Negotiating distance: 2 letters and 3 conversations on artistic research in contemporary circus consists of a paper box containing the two Open Letters and a booklet called Is there a way out of here?, which talks about the creative processes of ANECKXANDER (2015) and Raphaël (2017). The box is available to buy online in English, Dutch and French here, or can be bought in person at Circuscentrum, the library of KASK, or Vooruit. 10th of October 2015. I am in a small, brightly lit room in the centre of Rotterdam. In one corner is a stack of about fifteen chairs. Same amount of people. We have just walked here from the steps of the Rotterdamse Schouwburg and are now standing together rather awkwardly. We don’t know each other. Floor Van Leeuwen, who is leading the conversation, asks us to each take a chair. We arrange our bodies in a circle, and she explains the rules for the evening. Together we engage in the Conversation without words, one of eighteen conversations that take place over the following six days under the title Building Conversation, a ‘small-scale festival’ by theatre-maker Lotte van den Berg (NL) and visual artist Daan ’t Sas (NL). The rules are as follows: together we determine both the length of the conversation (1¾ hours) and the diameter of the circle of chairs (about 3 metres). In this time and space no one may speak. Everyone has one joker. If you use your joker, you can leave the room just once. If you come back in, you have to stay until the end. During the Conversation without words, I experience what happens when we abandon spoken language yet still engage in conversation with each other. What this reveals is that every conversation is in the first place an interaction, a dialogue, between looking at the other and being looked at oneself. The artistic research project of which this publication is a partial testimony was, in the first place, that kind of conversation. The gaze is often interpreted as an external manifestation of what is going on inside us. In that sense, one might say that our eyes ‘betray’ us. At the same time, however, they direct the other’s gaze, manipulating and provoking it, or actually trying to escape it. Our gaze is, as it were, used as small change in an unceasing and mutual negotiation of either distance from or proximity to the other. Viewed this way, looking at the other person, or the Other, always implies a fluctuating power balance; this dimension of power and the attempts to escape from it were also constituent parts of the research project. Negotiating distance: 2 letters and 3 conversations on artistic research in contemporary circus consists of a paper box containing the two Open Letters and a booklet called Is there a way out of here?, which talks about the creative processes of ANECKXANDER (2015) and Raphaël (2017). The box is available in English, Dutch and French.